I have just finished reading a novel set in Dunedin. You could say it is a church novel: its central character is a Presbyterian minister; and its plot involves the life of a church community. In the background of the novel is the discomfort both minister and community express at the irrelevance of the church today to the life of the society about it. We know all about this. The same unease affects us all – we may remember when the churches were full on Sundays, but now with shops trading seven days a week; with the world offered by the internet; with secularism so fashionable; and with faith so under question and so out of fashion and out of favour, the church seems side-lined to the margins and we expend a great deal of energy expressing our anxiety and wondering how we can reclaim relevance; how we can tell the story of faith in such a way that everyone will listen once again. The truth is that the world has changed. The gospel this morning gives another perspective to such unease. The first thing we may notice about this gospel is that Jesus is in Jericho, this is the city where the steep climb to Jerusalem begins. This is the way to the cross and prior to this passage Jesus has repeatedly reminded his disciples of what must happen to ‘The Son of Man’ but they don’t seem to see what he is getting at and warning them of. They are blind. Now, where is Bartimaeus in this? Notice his location, he is just outside Jericho, out of the way, outside the city gate; he is on the side-lines – a marginalised person. Is this a literal location? I suppose it is; he is strategically located to appeal for help and beg from passers-by; he is not obstructing a storefront or blocking a thoroughfare. But is it also a symbolic location? Is wisdom and truth to be found on the side-lines, on the margins, rather than in the centre of action, drama and business? Do you have to be on the side-lines before you can see what really matters? 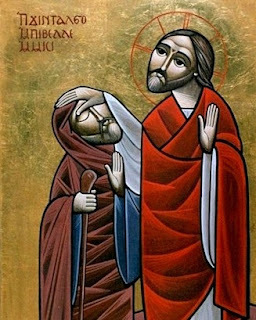 The story tells us that Bartimaeus, hearing of Jesus in the vicinity, made a nuisance of himself, bravely persisted in doing so and, when Jesus approaches him Bartimaeus throws off his cloak and Jesus heals him. It was a blind man who recognised who Jesus was; through Jesus he becomes a blind man who now sees. We are told that he followed Jesus on the way – this is the way that leads to the cross. There is another aspect to this account of Bartimaeus. That little detail of ‘throwing off his cloak’ – why was that included? Is it a symbolic action? Does more symbolic depth reside in this part of Mark’s gospel than a casual or literal reading may reveal? If it is a deliberate symbolic statement – how does that start to amend how we read scripture? Is Mark the gospeller drawing us beyond what the narrative can provide; beyond what any words can provide? Traditionally the cloak is a garment symbolically associated with philosophy – it is above all else – the philosopher’s garment. So is Bartimaeus now abandoning contemplation of philosophy for the reality of God in Christ; dropping his cloak he follows in the way that leads to the cross; is philosophy abandoned for action? It is also not just the cloak – but also his name. Bartimaeus can be read as the ‘Son of Timaeus’. 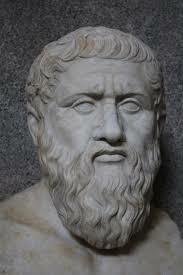 Those of us with some interest in such matters will remember Plato’s philosophical text, the dialogue known as ‘Timaeus’ in which the character Timaeus speculates as to the origin of the universe and the purpose of its creator. Most relevant to our gospel, it is interesting to note the section in the dialogue where Timaeus voices his opinion that sight is the greatest benefit to us for without it we would not see the order of creation and the evidence of its creator. Hold that thought against this gospel – when Bartimaeus can see, he follows Jesus in the way – to the cross. It is the blind Bartimaeus who – side-lined in the darkness that we may also call faith – calls out to Christ and in response to Jesus’ call, abandons his cloak. Can we imagine this as what we have called ‘the leap of faith’; making that deliberate choice for Christ? What follows is healing and sight – and the following of Jesus in the way – leading to the cross. So in this Cathedral, so much in the centre of our city, it is salutary to consider that the proper place for the church, for all Christ’s followers, may be on the side-lines, the margins, where we try and see what God is doing and what really matters. This is where Christ finds us and draws close – drawing us into light and into following him.